There’s plenty of good reason for that, starting with a relatively stable economy, a strong democracy and unparalleled natural resources for a place its size (a little less than a third of Wisconsin’s land area, but with coasts on both oceans and mountains in between). Our first week was spent on the steadily developing Pacific Coast, at Condovac, a time-share resort on Playa Hermosa (“Beautiful Beach”). Yami’s sister and sister’s husband own a Condovac share and are able to rent additional condos for reduced rates when they’re available. The condos are clean, comfortable and utilitarian – a basic kitchen and living area, plus a bathroom and bedroom with two doubles. That’s still small enough for a family to get on each other’s nerves, but the beauty of Condovac and Playa Hermosa were enough to keep us outdoors for most of each day. While I did review one scholarly manuscript at Condovac, I was careful to avoid virtually all other work outside of some minimal daily housecleaning tasks (and Yami would almost certainly say that “minimal” is an overly generous description). We had a fairly basic routine: wake up and eat, plod up the very steep hillside to Condovac’s pool or down a hundred meters to its private beach area, do the summer water routine, go back to the condo and eat, maybe rest and shower, go back to the pool or beach, clean up and eat, and find an evening activity before turning in early. The resort offered everything from karaoke to live bands to a Michael Jackson impersonator, but we did a good job wearing ourselves out in the water – or, in my case, lying around watching others wear themselves out while I read. I grant that this, in principle, is not the ideal state of being for an outdoor-recreation writer, but everybody needs a vacation, right? Every 30 minutes or so I’d stroll over to the surf or the pool, but generally I was content to lie under the coconut and other palms on the beach with the crashing surf as a soundtrack and the view of the tall, forested hills surrounding the horseshoe-shaped bay. On the hilltop, the resort’s pool and entertainment complex was nothing special except for the setting, which, to virtually any Midwesterner, would probably be a heavenly change. The requisite infinity pool overlooks the same bay (Bahia Hermosa) and the hills from above. Thatched palm-frond umbrellas over poolside tables, an open-air restaurant and bar, a swim-up bar, and other facilities were all surrounded by lush landscaping, which is omnipresent at Tico tourism locations. Smooth tile and an abundance of rich, dark-lacquered Costa Rican wood give a cool, clean feeling to many Costa Rican homes and businesses, and Condovac was no exception. Although plant varieties are rampant, hotels and other attractions generally present their manicured forms – gardens of bougainvillea, heliconia, bromeliads, orchids, ferns, palms, and all other manner of both greenery and colorful flowers. At Condovac, there were also the requisite concrete-cast likenesses of indigenous sculpture. Because my wife once was involved in the tourism industry in Costa Rica (and another sister-in-law still runs a small agency), I’ve seen enough hotels to know what to expect. Everywhere are carefully designed, beautiful and still somewhat artificial-feeling environments, but after a long winter and wet spring in Wisconsin, it’s tough to complain about the human tendency to neaten and regiment the immediate surroundings. Beyond the poolside and gardens, we had a spectacular view of the bay, including several small islands that are really little more than very tall rocks jutting out of the sea. Isla Montosa and Islas Pelonas add greatly to the scenery and the gorgeous sunset pictures that were easy to snap virtually every night we were there. From above, there’s also a bit more housing development to look at, and the view has changed fairly dramatically since we first visited Condovac in 1998. 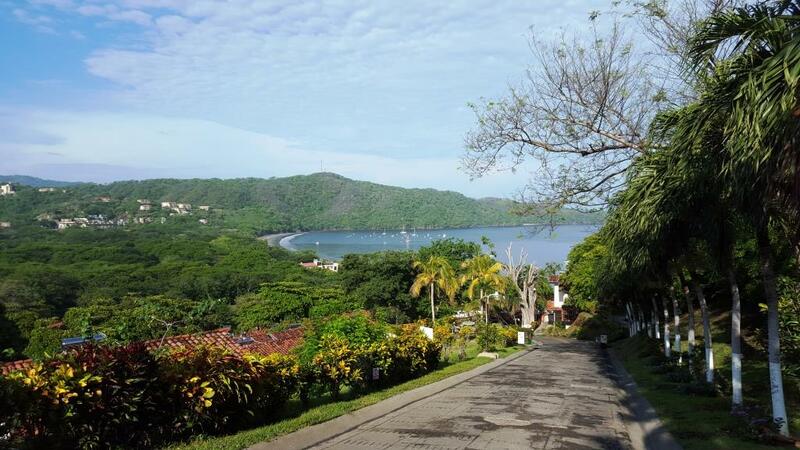 We noticed it most in both the number of large and very nice homes that can be seen from the Condovac pool area and the distinct lack of both howler and capuchin monkeys. Those used to be far more numerous, both visually (bold little capuchins were not afraid to come to tables on the decks overlooking the bay) and aurally (the distinctive guttural bark of the howlers is impressively loud and deep for the monkeys’ size). I only saw howlers once at dusk and heard them another time or two. 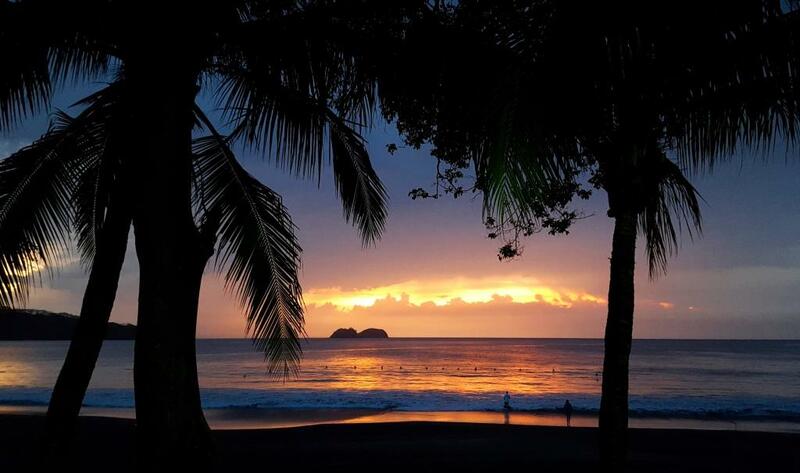 Playa Hermosa is known for its cleanliness and safety, which is not to say others in Costa Rica are bad. Some, however, like Playa Coco just around the bordering hills to the south, are more attractive to younger, rowdier crowds and all that entails. All in all, we used the vacation to do exactly what we needed most: nothing. For me, that meant less thinking and writing than normal, but coming to a place like Costa Rica from a place like Wisconsin means one can’t help but make comparisons. That’s for next week’s column, however. Married in Costa Rica 17 years ago, I have returned about once every five years until our recent commitment to visit annually for family reasons. We were fortunate to find relatively inexpensive tickets this year. Even better: direct flights. 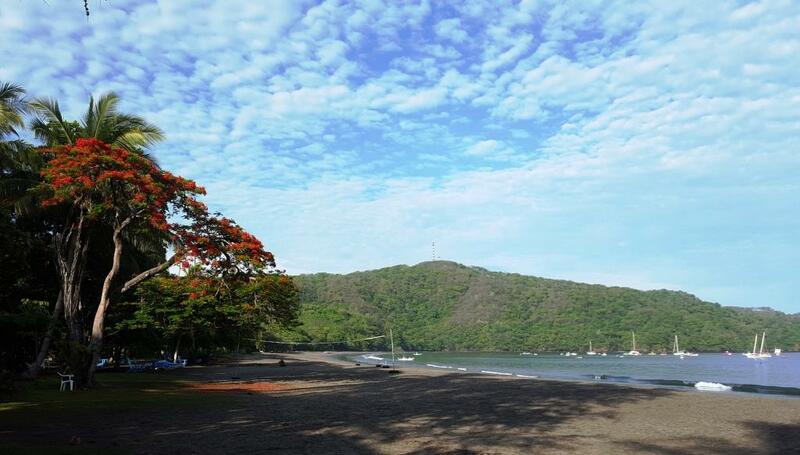 At $425 apiece, we flew round-trip from Chicago O’Hare to Daniel Oduber International Airport in Liberia, a city of about 60,000 that is the capital of Guanacaste Province, where a large number of Pacific Coast beach resorts are located. That substantially eased our two-week trip – the maximum for Yami, with her limited vacation. It meant we could drive to Chicago on a Friday night, where we had a park-and-fly deal at an airport hotel. Our 8 a.m. departure and early-afternoon arrival in Liberia put us on the beach with plenty of daylight left, despite the early tropical sunsets (generally about 6:30 while we were there; Costa Rica does not observe daylight savings time). 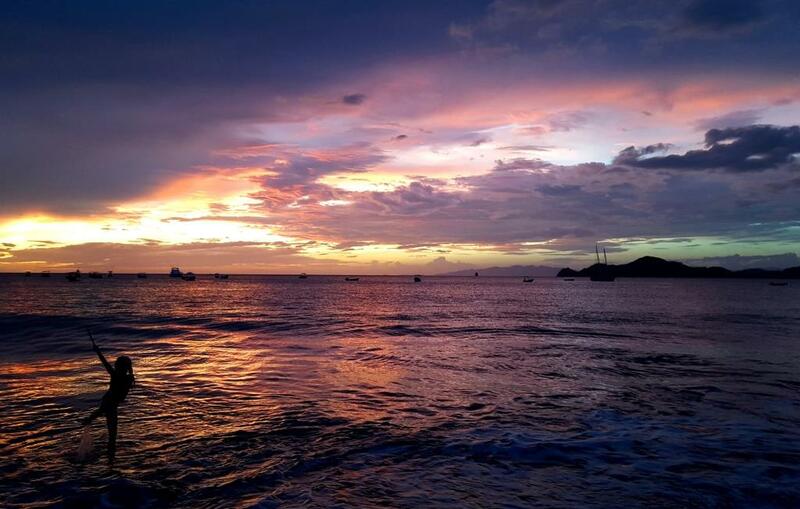 After a week inland at Yami’s family farm, we also stayed in a Playa Hermosa hotel on our last night in Costa Rica. That meant a quick dropoff of our rental car halfway between beach and airport; it only took us slightly more than an hour to get from the hotel to our airport check-in. We enjoyed a wonderful and leisurely breakfast on the beach and easy drive through the countryside to the airport, generally avoiding the normal hassles of multiple-leg flights. Most travelers to Costa Rica fly to the capital, San Jose, but Liberia’s much smaller airport – some flights’ passengers have to walk across the tarmac in the rain — will probably remain our preferred option, especially with direct flights. This post originally appeared in the July 8, 2016, edition of The Portage County Gazette.